Can you imagine a Banff wedding on the top of world at Canadian Rockies? or on the banks of a turquoise lake surrounded by glacier-capped peaks with a crisp blue sky background? 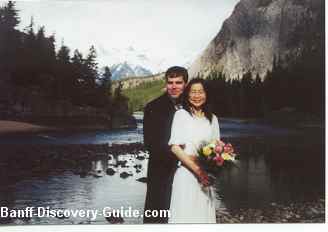 There are lots variety of weddings in Banff, Lake Louise and Canmore you can choose. If you want an adventure wedding, you can choose Heli-weddings including Heli-skiing wedding, skiing wedding, Canoe wedding, Horse Riding wedding, etc. If you want a relaxing wedding, you can choose from a simple elopement at Cascade Garden or at a scenic outlook, to an elaborate ceremony at a luxury hotel such as Banff Springs Hotel, Chateau Lake Louise. Banff wedding is fantastic! We are so love in this magic gem hidden in Canadian Rockies, we had our own wedding here. We had a simple, small and casual ceremony in May at Central Park Gazebo by the Banff Bow River. Our original plan was at Hoodoo Viewpoint where you have spectacular views of the Tunnel Mountain, The Bow River, Mt. Rundle, and Banff Springs Hotel. But it was rain at the last minute, so that we change the location with recommendation from our marriage commissioner Mr. Rick Kunelius. My husband found Mr. Rick Kunelius online. He is very friendly and cheerful, helpful person, and have a sense of humor. After ceremony, the rain stopped, then we were heading to Bow River, Banff Springs Golf Course etc. for our wedding photos. Our photographer is one of our best friends. We had our wedding cake and dinner at a very good Italian restaurant on Banff Avenue which was unfortunately closed down years ago. We enjoyed staying in first-class cozy and woodsy Banff Buffalo Mountain Lodge. My in-laws family members (4 of them) stayed in one of the fully equipped kitchen two-bed room loft suites of Tunnel Mountain Resort Banff, which is crossing street of Buffalo Mountain Lodge. They wished they could stay longer. My brother was satisfied to stay in a room with mountain view balcony in Park Lodge Banff , which is 4 star-full service and has good value for the money. you would like to share ? What type of wedding do we choose? An adventurous Wedding, an elaborate ceremony in a luxury hotel, a religious ceremony in a church, or find a favorite location for a simple and small wedding? Who will be our marriage commissioner? Who is the best wedding photographer that meets our budget? What about hair, makeup and flowers? What about dress and tuxedo? Want perfect music complement to the wedding? Want luxury wedding car or limo rental? Will we hire a wedding planner to arrange everything for us and make our life easier? Organizing a wedding in Banff sure take some planning. I have provided references for each question you might ask. You either click here, or click at each question above. You will need to complete a registration form if your wedding ceremony is in Banff national park boundaries, so that Park Canada ensure their awareness of these special conditions. Your Banff Wedding or Honeymoon? Were you married in or around Banff? Did you honeymoon in Banff? Are you planning to? If you have a special wedding or honeymoon story, I would love to hear all about the magical experience!